Being made homeless with your wife and baby son after being let go from your job at a marijuana farm in California doesn’t exactly sound like the beginning of a successful music career. However, for thrice-Grammy nominated musician and producer Anderson .Paak, this is exactly what set him on the path to release a string of acclaimed albums, all heavily rooted in funk and soul, as well as countless collaborations with some of hip hop and pop’s most coveted artists, including Bruno Mars, Kendrick Lamar and Snoop Dogg. 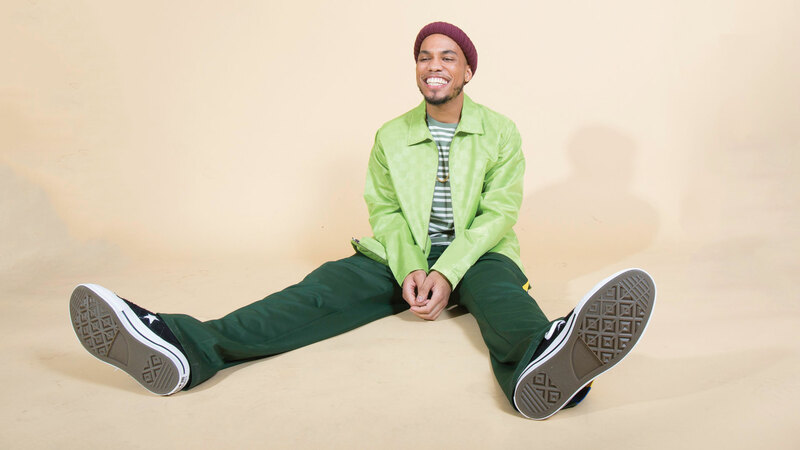 With the recent release of his Dr Dre-produced album Oxnard (the song, Bubblin’ is nominated for Best Rap Performance at this year’s Grammy’s), we spoke to .Paak ahead of his January gig at Spark Arena and talked to him about his much-raved about live shows, working with Dre and his favourite NZ musicians. You’re known for your energetic live shows and infectious stage presence. Do you have to psych yourself up to get into that head space? When I’m doing the show, it’s the funnest time when you’re up on stage. When you see the crowd, it gives me the good energy. I’m with my bros, everything’s moving. But sometimes, everything leading up to that can be a little stressful. I might not have the best day or I might be tired so it’s just about getting my mind right just before the show. Right before the show, I visualise everything; it’s working out good, it’s coming together, I’m feeling it. But I don’t usually have to psych myself up, I’m just hyped to play. What do you want to audience to feel when you’re up there playing? I just want them to be happy, free. That’s how I feel when I’m on stage: Free. I want them to have like a religious experience. I feel like I’m not insecure or anything. I hope the people in the audience are feeling that too. They’re getting fed inspiration and the energy is going through them too and they leave different, like they’re fired up. It’s that feeling. Your most recent album Oxnard heavily draws on funk sounds, as does a lot of your previous work. What draws you to this style of music? I think it’s naturally where we were at with this. I’m a musician first and I play drums. When I was coming up in church, I grew up listening to soul, funk, hip hop, R&B and gospel. That was my foundation and everything else just added on top of that. But I think my ability to play an instrument just gives me the ability to do whatever and have a lot of range and dip into this, dip into that. I can play around with things and never be boxed in. I feel like if didn’t really have a big vocabulary like I do with instruments, I would probably be a little more boxed in. Dr Dre is an executive producer on your latest album. What do you value most that he was able to bring to this project? He was just a great co-pilot, a great mentor. Someone that was awesome to bounce ideas off of. He mixed the hell out of the album. He was co-producing everything pretty much, overseeing it and just helping me structure it. He told me it was really good for him to get back involved with an artist and work hand in hand with something again and it really helped him get inspired as well. So it was fun to befriend him and then actually get the opportunity to really make an album with him and actually it coming out. It’s pretty rare now so that was great. In the past, you’ve collaborated with a wide range of different artists. Is there anyone you haven’t with yet that you would love to get into the studio with? I’m working with a lot of people that I wanted to work with. I would love to work with Beyonce, Rihanna, Adele. I’d love to work more with Bruno [Mars]. There’s so many people. I need the Drake feature! As well as rapping and singing, you are also a percussionist. Are there any other instruments that you want to master? Fluke, the piano, bass guitars. Your show in January will be your second time in New Zealand. Did you get to spend much time here outside of your show last time? I did. We went to Piha beach. We did go around to some beaches and we partied a little bit. So I did have a good time there. Are you familiar with any New Zealand musicians? Oh s**t, is it… Unknown Mortal Orchestra? That’s probably my favourite band. Yeah, Ruben [Nielsen], man, that dude is crazy. There’s a reggae band too, is it Katchafire? You also have your own charity Paak House. Can you tell us about that and how it came to be? My business manager bought it my attention and said I should start a foundation, I should give back. We should start it up and we can branch out, we can use my influence for that. So we talked about what we wanted to do and I know for me when I was really young, I was exposed to music at an early age and it changed the course of my whole life. So I just wanted to give an opportunity to underprivileged kids where they can be exposed to better music, better ways to eat, better ways to use their money, everything. So we started the Brandon Anderson Foundation and .Paak House was the first initiative. So with .Paak House we want to expose the underprivileged, the people that get overlooked, to those things like music, better ways to eat, better ways to use their money and everything. Eventually we want to have our own legit .Paak House where kids can come through and have a place to just be themselves. You have two kids of your own, is music a strong presence in their life? Yeah, well my oldest one is seven years old. He’s like me, he’s into a lot of things. He loves to dance, he’s now starting to play drums, he plays keys. And he’s getting into sports, he’s getting into boxing. But I think he’s watching me now and he’s trying to figure out what is something that can daddy can do that I can do. He’s onto something like that. He’s just a natural at anything he wants to do. But he loves music, really loves music. It’s crazy because he knows exactly what he likes and what he doesn’t like. So it’s like the Dr Dre thing, he’s on or off. It’s just basically not being anxious or anything. Everything happens in a timely order. Some things you don’t really have to chase for, some things are just naturally going to come to you. As long as you have your goals set and you really focus on knocking those things up, you don’t have to be anxious about making the right decision or jump to conclusions or trying to chase something that’s not for you. Just being chill and confident in what you’re doing, stay focused on the task and trust the process. Another thing with Dr Dre, Dre doesn’t do anything that doesn’t feel right. A lot of times things come up and people will offer you a bunch of money or exposure or whatever and it just doesn’t make sense to do it all the time. So it’s all just about not going for the short money, it’s about the bigger picture and waiting for those things and not being afraid to say no to a lot of stuff. If you could only listen to one album for the rest of your life, eat only one meal for the rest of your life and watch one TV show for the rest of your life, what would those three things be? Woah! One album, one meal and one TV show… Well, with the album it would probably be Voodoo by D’Angelo. Meal would probably be gluten-free pizza. And the TV show would be Martin.